The RC-Micro 5.1 is Energy's most compact speaker system to date, and it proves that smooth, expansive surround sound can come from tiny speakers. Each of the four matching satellites stands no taller than a soda can, and the subwoofer takes up only about a cubic foot of space. 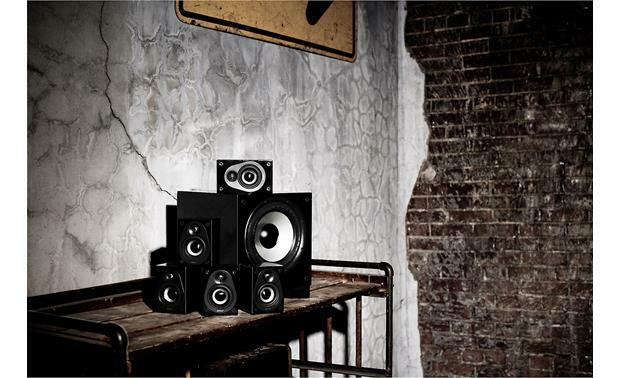 Energy speakers excel at delivering flat frequency response, for even, accurate sound. The tweeters are placed as close to the woofers as possible, helping to blend high and mid-range frequencies. The overall result is sound that's uniformly dispersed throughout your room. The 60-watt subwoofer pumps out clean, deep bass, thanks to its 8" front-firing woofer and down-firing port. The sub's proprietary Ribbed Elliptical Surround™ increases efficiency and fights distortion. It all adds up to powerful low frequencies that draw you into your movies and music. You can easily tuck the satellites on shelves or bookcases without sacrificing much space. Or for a more sophisticated look, wall-mount them with the integrated keyhole slots, use optional brackets with the threaded inserts, or position them on stands. All six pieces have a sleek, high-gloss finish reminiscent of a grand piano. These speakers complement just about any décor, and they look right at home next to today's flat-panel TVs. Just set up the system, everything seems really good, small yet big sound. Have the fronts hanging from the keyhole mounts directly on the wall. Devon AVR E-400 as receiver. I was wondering what music sounds like on these speakers? From country to rock. I realize these are not tower speakers, but how satisfied are with their ability to play music? I was really surprised how well these speaker sound cause of how small they are! Great sound at a good price. Overview: The ENERGY RC-Micro 5.1-Channel Home Theater System features four matching satellite speakers, a center-channel satellite speaker, and a powered subwoofer. It includes a powerful 240-watt (Dynamic) powered subwoofer with a down-firing port, 8-inch driver and Ribbed Elliptical surround for bass that you feel as much as hear. The .50-inch hyperbolic aluminum dome tweeter on the satellites and center channel focuses sound for clearer dialogue and music. The ENERGY RC-Micro 5.1 System utilizes proprietary technology and high quality components that allow you to enjoy natural and accurate music reproduction. The micro-sized satellite speakers and subwoofer each feature a high-gloss black finish that look great with contemporary flat panels. Gold plated push connectors ensure positive connection for high performance. Flat On-Axis Frequency Response With Wide Bandwidth: The ENERGY 5.1-Channel Speaker System reproduces the entire audio range in a uniform manner. By ensuring that no one frequency dominates any other, the RC-Micro 5.1ch System ensures that every note is the way it was intended to be, and the sound as natural as possible. Wide and Constant Dispersion: The RC-Micro 5.1 System provides an even pattern sound at all frequencies in all directions throughout the room. Low Distortion Resonance: No speaker system is distortion or resonance-free, but the ENERGY 5.1 Speaker System has achieved a significantly lower distortion level with a clearly audible improvement. 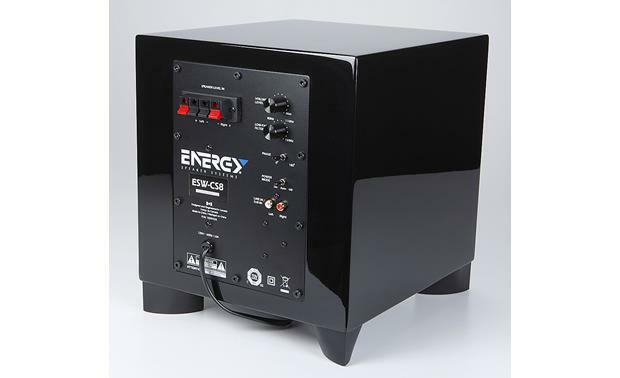 Amplifier Requirements: The ENERGY RC-Micro 5.1 System is designed to operate on a wide range of AV receivers and/or amplifiers with a power rating of 20 to 100 watts continuous per channel. The impedance for all speakers is 8-ohms, allowing almost any amplifier to function well. Break-In Period: ENERGY recommends that you break in this speaker system for 50 hours before playing the speaker at their full capabilities. This can be easily done by putting your compact disc player on Repeat mode, while playing a CD with a wide dynamic range ant normal listening levels. 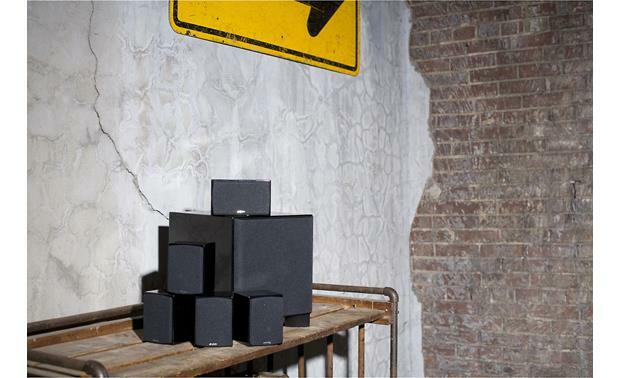 4 Matching Satellite Speakers: The ENERGY RC-Micro 5.1-Channel Home Theater System features four matching micro-sized satellite speakers. Each satellite speaker features a high-gloss black finish, a removal cloth grille, gold-plated spring-post terminals (accommodates up to 15 AWG speaker wire), and a rear-mounted key-hole slot for wall-mounting (mounting screws not supplied). The key-hole slot can be removed to reveal a 1/4"-20 threaded insert for wall-mounting the speakers using an optional bracket (sold separately). The satellite speakers can also be placed and secured on optional speaker stands or shelves using the supplied self-adhesive rubber feet. Drivers: The micro-sized satellite speakers feature a 0.5" Hyperbolic Aluminum-Dome tweeter and 2.5" High-Excursion Aluminum Cone woofer with a rubber surround inside a magnetically shielded acoustic suspension enclosure. The speakers are rated at 8-ohm. The satellite speakers have a frequency response of 150 to 23,000 Hz. 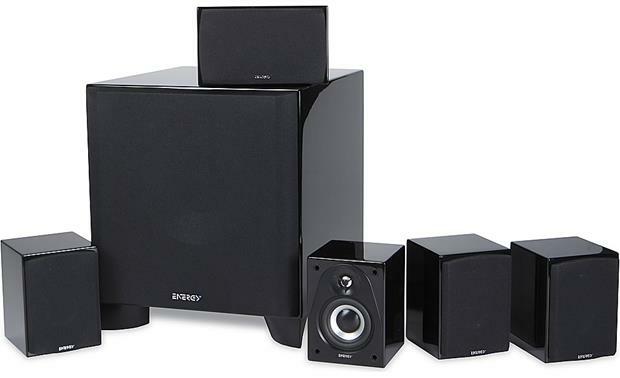 Matching Center Channel Speaker: The ENERGY RC-Micro 5.1-Channel Home Theater System's matching center-channel speaker is slightly larger than the four matching micro-sized satellite speakers and can be mounted horizontally or vertically. 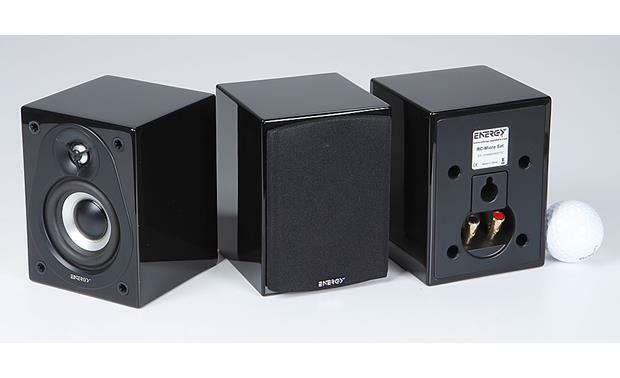 The center-channel satellite speaker features a high-gloss black finish, a removal cloth grille, gold-plated spring-post terminals (accommodates up to 15 AWG speaker wire), and a rear-mounted key-hole slot for wall-mounting (mounting screws not supplied). The key-hole slot can be removed to reveal a 1/4"-20 threaded insert for wall-mounting the speaker using an optional bracket (sold separately). 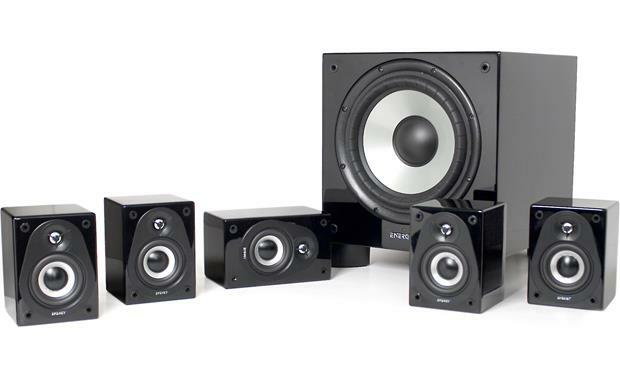 The center-channel speaker can also be placed and secured on an optional speaker stand or shelf using the supplied self-adhesive rubber feet. Drivers: The center-channel speaker features a 0.5" Hyperbolic Aluminum-Dome tweeter and 2.5" High-Excursion Aluminum Cone woofer with a rubber surround inside a magnetically shielded acoustic suspension enclosure. The speaker is rated at 8-ohm. The center-channel speaker has a frequency response of 150-23,000 Hz. 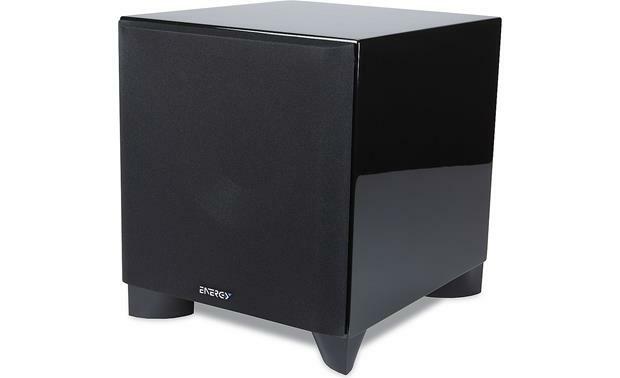 Powered Subwoofer: The ENERGY RC-Micro 5.1-Channel Home Theater System features an 8" powered subwoofer with a 60 watt continuous (240 watts dynamic) amplifier. The powered subwoofer contains a front-firing injection molded 8" cone woofer with a ribbed elliptical surround inside a bass reflex enclosure with a down firing port. The 8" woofer is powered by a built-in 60 watt continuous (240 watt dynamic) amplifier. The powered subwoofer has a frequency response of 36 to 180Hz. Volume Level: This knob can be adjusted to control the level of output from the subwoofer. The level chosen should allow the subwoofer to blend its output with the rest of the 5.1-channel speaker system. Low-Pass Filter: This control allows for the adjustment of the low-pass filter. Adjustments can infinitely be made from 40 to 150Hz. This will determine the highest frequency that the subwoofer will reproduce. Power Mode: This switch can be set to either On, Off, Auto. If the switch is in the Off position, the subwoofer will not power up. If the switch is in the On position, it will constantly remain on. If the switch is set to the Auto position, when a signal is present the subwoofer will turn on and will automatically turn off several minutes after a signal is no longer present. Status Indicator (Front-Panel): The LED found on the front panel will illuminate in blue when the subwoofer is functioning. If the unit is Auto mode and is not receiving a signal, the light will remain off. Line/Sub In: These inputs are an RCA type LFE/stereo/mono input. If you are connecting your subwoofer to an A/V receiver with an LFE or Subwoofer preamp output, connect a single RCA cable to the LFE/Left input. If you are connecting your subwoofer to an AV receiver without a dedicated subwoofer or LFE preamp output but does features a stereo RCA output, use stereo RCA cable and connect to both the LFE/Left and Right inputs. Speaker Level In: The Speaker Level input are designed to be used on receivers or amplifiers that do not incorporate any RCA type subwoofer outputs. If your receiver is equipped with an RCA type subwoofer outputs, these speaker level inputs should not be utilized. Power Cord Connector: The powered subwoofer features an attached 7' AC power cord terminate by a two-prong AC plug. Speaker Placement: Speaker placement can be critical in the performance of any home theater speaker system. Follow these guidelines to get the most out of your ENERGY RC-Micro 5.1 system. Front Satellite Speakers: For best stereo imaging, the left and right speakers should be the same distance from their respective side walls. If the distance from one speaker to the listener is very different from the other, it can affect the soundstage or stereo imaging. Therefore, the ideal position is having the speakers equidistant to you, the listener. Center-Channel Satellite Speaker: The center-channel can be expected to reproduce as much a 60% of a movie's soundtrack, most of which is dialogue. In order to maintain the effect of voices emanating from the actor's mouth, the center speaker should be centrally located between the left and right main channels and placed above or below the television. Be sure that the center speaker's front baffle is flush with the front face of the television or cabinet to maximize dispersion. Side Walls: For best results in side wall mounting applications, position the speaker adjacent to and slightly behind the primary listening area at a height of approximately 6 feet. Rear Walls: For best results mounting on a rear wall, position the speakers so they flank the main listening area and point towards the front of the room. They should be raised to a height of approximately 6 feet and should ideally have a space of 6 feet between them. 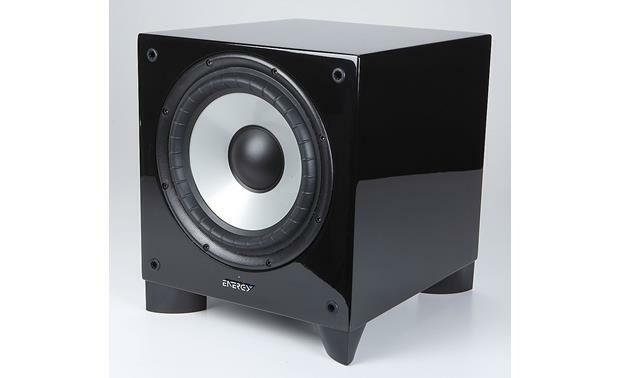 Corner Of Room: Results in a boomy or exaggerated low frequency response. Side Wall: Moderate bass performance with increased fidelity over corner placement. Beside Front Speaker: Creates a better blend with the front speaker, but sacrificing overall volume. I would like to know which subwoofer cable you recommend?. there are 2 inputs on the subwoofer, and 1 outpout at the denon avr e 400 receiver. Thanks. I use a Monster Cable 600SW, high performance. Monster Cable all the way. Crutchfield has others, but Monster has always been upper tier and the standard which others are judged by. I use a Monster Cable 600SW, high performance. You only need the standard cable. I had the same confusion when I received my subwoofer. I don't remember if you connect to the top or bottom input, but it's in the instruction manual. I forwarded your question to an Advisor and they responded with the following: Modern sub cables are only one plug, and the customer will only use one plug into the sub. It should be labeled LFE, but if it's not just use the left or right. There is only one speaker, not left and right speakers. You want to choose the correct cable for the customer based on the length needed. Here is a link to all of our Sub-woofer cables. http://www.crutchfield.com/g_20111/Subwoofer-Cables.html?tp=2586 If you would like to discuss further you can contact an Advisor directly by phone (1-800-324-9695) or online chat. I have an open concept floor plan. Kitchen, dining and living room. Would this system sound ok in a large open area? Floor plan is also open beam. I forwarded your question to an Advisor and they responded with the following: I would recommend going with something a bit larger for an open floor something. A full size bookshelf speaker or floorstanding speaker will be ideal for filling a larger area with sound. If you would like to discuss further you can contact an Advisor directly by phone (1-800-324-9695) or online chat. They sound amazing. They produce good spectrum from anything I throw at it. From Meatloaf, Van Halen, Pearl Jam, Rolling Stones, Bethoven, Bryan Adams... Everything sounds excellent. Just make sure to pair it with a good amp or receiver. For casual listening of music these speakers are fine. If you are more serious I would consider upgrading for music. I have an Onkyo receiver that I purchased with the Energy speakers knowing I would be adding larger book shelf speakers dor my music. The Onkyo has a second zone that I can run the additional speakers I plan on purchasing. Still researching dor those speakers. I would say from my experience they sound fair to good with music. Sub woffer is fine but center and side speakers could be richer, especially at low volume. Hut overall a good value for the price. Jim W.
I was a little skeptical at first, given their size related to my room size (about 14 x 30). After installation all questions disappeared. Mostly we use the system for TV, and the quality of sound is right up there with the more expensive speakers, crisp, clear, good bass, and lots of adjustment. If your room size is smaller than mine, I can only imagine the improved quality you will experience. And by the way, this is my first purchasing experience with Crutchfield, but certainly not my last. 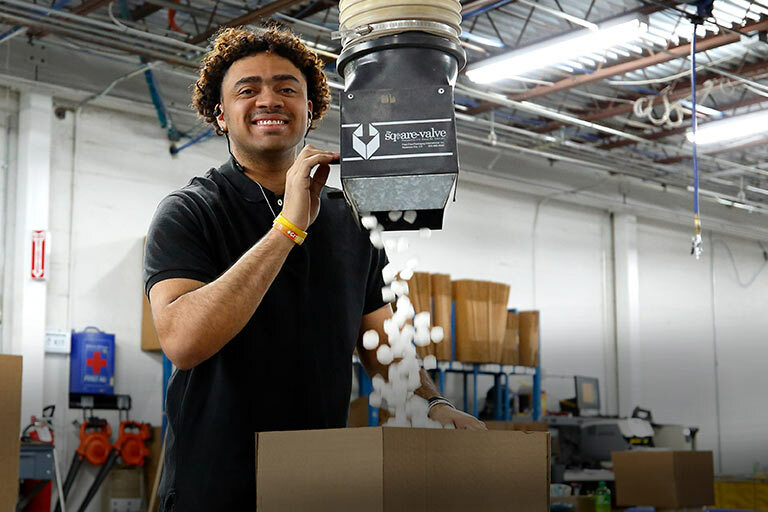 They are BIG on quality of product and making sure their customers are satisfied with their purchase. I purchased these speakers, along with the Sony STR-DN1040 AV Receiver, and the speakers sound great. I've listened to music through the speakers, both via FM tuner and AirPlay through the AV receiver and I'm very satisfied with their sound. I've listened to Contemporary Christian Music (similar to pop/rock), as well as country music and it all sounds great. These speakers also look great in our living room.